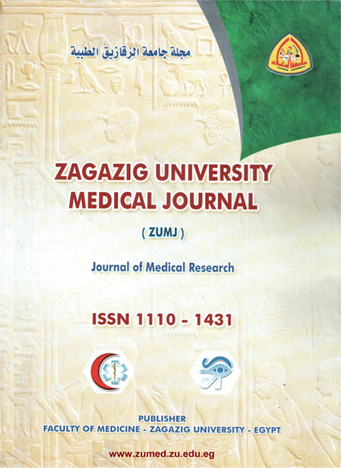 Ophthalmology Department, Faculty of Medicine, Zagazig University, Zagazig, Egypt. Background: Keratoconus can cause gradual distortion of vision due to progressive myopia and irregular astigmatism. keratoconus is classified into four stages. The treatment is stage specific starting from glasses or hard contact lenses in the very early stages passing to intra corneal ring segments(ICRS) with or without collagen cross linking(CXL) in the second stage then deep anterior lamellar keratoplasty (DALK) or intra corneal ring segments in the third stage ending with penetrating keratoplasty in the fourth stage. Patients and Methods: This study included 50 Patients from attendants to outpatient clinic Ophthalmology Department, Zagazig University. Those patients were diagnosed as moderate keratoconus according to modified Amsler classification. The patients were divided randomly into 2 equal groups each one involved 25 eyes. The patients of the first group had DALK using the double bubble modification of the Big Bubble (BB) technique while patients of second group had femto assisted intrastromal corneal ring segment (KERA) implantation. The patients were followed up for 12 months. This prospective randomized interventional study aimed to evaluate and compare intracorneal ring segments (ICRS) versus deep anterior lamellar keratoplasty (DALK) in treating moderate keratoconus. A complete ophthalmic examination was performed, including visual acuity, refraction, and keratometric readings. Results: The primary outcome measure in this study was the best corrected visual acuity (BCVA) at the end of follow up period which is 12 months while the secondary outcome measures were the uncorrected visual acuity (UCVA), mean spherical and mean K value. In the first group (DALK group) the mean UCVA preoperatively was 0.05 ± 0.001 and mean BCVA preoperatively was 0.08 ± 0.001while postoperatively the mean UCVA was 0.1 ± 0.02 and mean BCVA postoperatively in the 3rd month was 0.25 ± 0.02 and in the 6th month visit was 0.5 ± 0.02. In the second group (ICRS group), the mean preoperative uncorrected visual acuity (Pre UCVA) was 0.06± 0.001 while mean preoperative best-corrected visual acuity (Pre BCVA) was 0.08± 0.001. The mean postoperative uncorrected visual acuity (post UCVA) was 0.21 ± 0.02 while the mean postoperative best-corrected visual acuity (post BCVA) was 0.4 ± 0.01. All patients of both group had progressive visual improvement in their BCVA compared to the preoperative one. In both groups also, the spherical equivalent, spectacle astigmatism and mean central K value showed significant improvement postoperative compared to preoperative. Conclusion: Both femtoassisted intracorneal ring segments and deep anterior lamellar keratoplasty are safe and effective surgical alternatives in treating patients with moderate keratoconus. Both of them lead to progressive improvement in the visual outcome of keratoconus patients. Achieving the deepest possible interface to reduce scarring, achieve a posterior layer of uniform thickness, perform smooth surface sectioning of both the graft and bed, make the graft tissue of appropriate thickness, obtain the highest quality donor material, insure good coaptation of the edges and uniform traction of the sutures, and make sure there is perfect cleanliness of the interface are the factors of obtaining best visual results after DALK procedure.